B.A. from the University of California, Berkeley; CrossFit Level 1 Trainer, CrossFit Coaches Prep Course, CrossFit Football, Certified Trainer, CrossFit Gymnastics Certified Trainer, USA Weightlifting (USAW) Certified Club Coach, NASM (National Academy of Sports Medicine) Certified Personal Trainer, NCSF (National Council on Strength and Fitness) Certified Personal Trainer, ACE (American Council on Exercise) Certified Personal Trainer. Originally from Huntington Beach California, Justin graduated from the University of California, Berkeley (aka CAL) in 1999 with B.A. in American Studies. While at CAL he was a 4 year Varsity letterman & 2 year starting linebacker for the Golden Bears’ football team. Justin began his career in the fitness industry as a personal trainer in 2004, was introduced to CrossFit in 2008, and obtained his Level 1 in 2009. 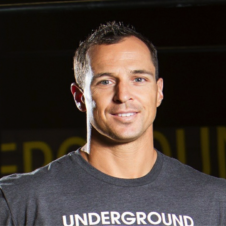 A former fire fighter, Justin relocated to Sarasota with his wife Stacy, and two daughters Sloan and Hayden in 2011 to follow his passion and open and run CrossFit Suncoast/Synergy Fitness, which he recently closed in March of 2018.